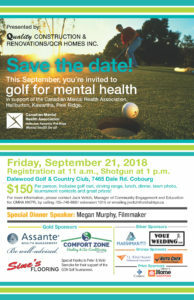 Canadian Mental Health Association, Haliburton, Kawartha, Pine Ridge (CMHA HKPR) is pleased to announce that Roger Hardy of Quality Construction and Renovations will be hosting a golf tournament in support of CMHA HKPR youth mental health programs and services on September 21, 2018. Registration is at 11 a.m. followed by lunch at 12 p.m. and a 1 p.m. shotgun start. Mr. Hardy and his wife Mary Ellen are excited to support the local mental health community. “We have a desire to make a difference by investing in youth mental health awareness. 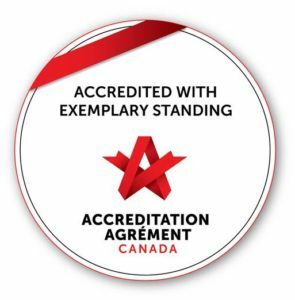 We believe that supporting the Canadian Mental Health Association is a great way to make this investment,” says Mr. Hardy. Golfers may register as foursomes or as singles at a cost of $150 per person. This includes use of the driving range, lunch and dinner, prizes, contests and a team photo. We are pleased to welcome our generous sponsors to the tournament. We would also like to acknowledge our prize sponsors, including Cameco and Gilmer’s Home Hardware. Other sponsorship opportunities are still available. For information on these opportunities or to register, please contact Jack Veitch at 705-748-6687 extension 1015 jveitch@cmhahkpr.ca or visit our website at www.cmhahkpr.ca. Mr. Hardy can also be contacted for interviews at 289-251-1408.